Entry by donation – with all proceeds going to support human rights and popular organisations in Chiapas and Juarez. 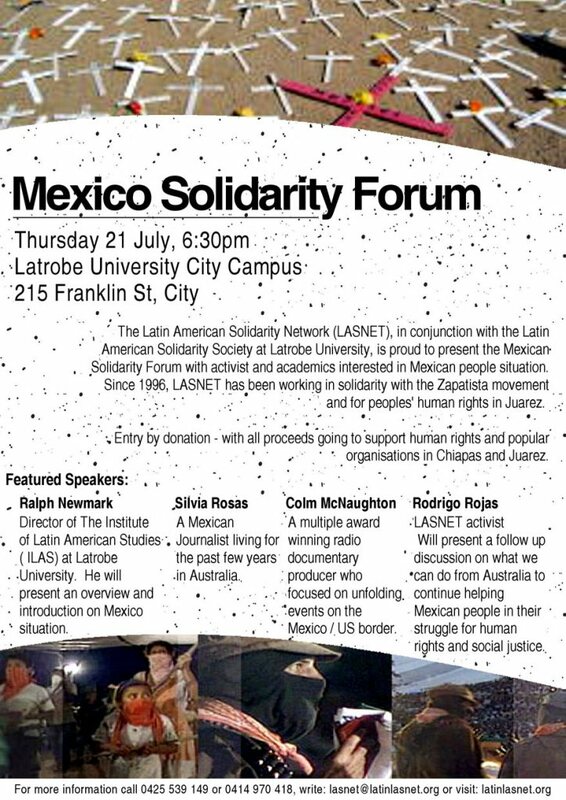 The Latin American Solidarity Network (LASNET), in conjunction with the Latin American Solidarity Society at Latrobe University, is proud to present the Mexican Solidarity Forum with activist and academics interested in Mexican people situation. Since 1996, LASNET has been working in solidarity with the Zapatista movement and for peoples’ human rights in Juarez. Today is time to reinforce our solidarity work with Mexico and we call on all people interested to join us in our effort because justice, dignity, peace and peoples’ rights cannot wait any longer. Because the only struggle lost is the one that is abandoned. ¡Para todos y todas, todo!, For all, everything! Ralph Newmark, Director of The Institute of Latin American Studies( ILAS) at Latrobe University. He will present an overview and introduction on Mexico situation. Silvia Rosas, A Mexican Journalist living for the past few years in Australia. Mexico has been caught in the middle of a spiral of violence since 2006. Roughly 35,000 persons, including numerous reporters, have been killed since then. According to statistics from the National Human Rights Commission, about 70 journalists have been killed in Mexico during this period, while another 13 remain missing. In addition, this organization reports 21 attacks on media facilities and says that since 2005 has received 473 general grievance complaints from journalists and human rights defenders. However, the journalists have declared that the main obstacle to investigating crimes against journalists is state authorities’ lack of collaboration and transparency, as well as reticence from the victims’ families due to distrust of the authorities. As result, Mexico is considered the most dangerous place in the Americas to be a journalist and the third in the world after Pakistan and Iraq. Colm McNaughton is a multiple award winning radio documentary producer who focused on unfolding events on the Mexico / US border. His radio documentary ‘La Frontera’ (available at:http://www.abc.net.au/rn/360/stories/2010/2844252.htm) recently won a silver medal at the New York Radio Festival 2011. He will speak about the his experiences on the border as well as explaining his understanding of unfolding events in the region. Will present the solidarity work for Mexican people and follow up discussion on what we can do from Australia to continued helping Mexican people in their struggle for human rights and social justice. Why is so important to support the people of Mexico Today? THE PSYCHOTIC MILITARY CAMPAIGN BY FELIPE CALDERON HINOJOSA, WHO HAS TURNED THE STRUGGLE AGAINST CRIME INTO A TOTALITARIAN ARGUMENT TO DELIBERATELY GENERALIZE FEAR IN THE WHOLE COUNTRY, IS CONFRONTED NOW WITH THE DIGNITY OF THE ORGANIZED VOICES OF RELATIVES OF THE VICTIMS OF THIS WAR. This entry was posted in LASNET events, Latin America in Struggle and tagged LASNET, Mexico solidarity, Zapatistas. Bookmark the permalink.